The most effective speakers use positive emotions to persuade. You can witness this truism in action in Michelle Obama’s speech from the first day of the Democratic National Convention. The convention got off to a rocky start. Many were outraged at revelations over the weekend stoking the darkest suspicions of Bernie Sanders’ supporters that the Democratic National Committee unfairly favored Hillary Clinton’s campaign. The leaked e-mails hit squarely at Clinton’s Achilles heel—the sense that she isn’t trustworthy. Some Sanders supporters made their fury known, booing at the mention of Clinton’s name and drowning out speakers throughout the first part of the convention. The organizers of the convention tried to tamp down the anger through music (done quite effectively via a surprise visit by Paul Simon) and through comedy, offered (somewhat less effectively) by Senator Al Franken and comedian Sarah Silverman. When Silverman, a former Sanders supporter, took the stage (accompanied by Franken) to offer brief remarks about why she now supports Clinton, some in the crowd were vocal with their displeasure. Franken and Silverman then found themselves in the awkward position of having to stall for time prior to Paul Simon’s appearance. In exasperation with the unruly crowd, a visibly frustrated Silverman said, “To the Bernie or Bust crowd: you’re being ridiculous.” Silverman’s reaction to the crowd was understandable, but the moment provides a perfect illustration of the point we have made in a previous post: You won’t persuade people by scolding them. This may have persuaded Clinton’s supporters, but Sanders’ supporters continued to jeer. Paul Simon quieted and briefly united the convention crowd by singing “Bridge Over Troubled Water.” But it was Michelle Obama who moved the divided audience to cheers. Michelle Obama had two goals: to inspire Clinton’s supporters and to persuade Sanders’ supporters to offer her their support. It was clear from the experiences of the speakers who came before her that she would need to say something to meet the emotional needs of the Sanders supporters before she could make an argument on behalf of Clinton. If she didn’t, they were likely to drown her out. So Mrs. Obama began with a theme that everyone in the room would be likely to support: the Obamas’ desire to be positive role models for their girls. The Obama family is quite popular, particularly among Democrats. What Bernie supporter would boo the image of the young Obama daughters, “the heart of our hearts,” as they headed out for their first day at their new school after moving into the White House? With that image, Mrs. Obama got the audience hooked. They were listening. They were imagining those girls listening, too. Mrs. Obama went on to explain that their children, and all the children in the country, look to their leaders to understand how to behave in the world. This was an important rhetorical moment in Mrs. Obama’s speech and an effective use of pathos. She calmed the crowd with the image of her beloved girls; she made her supporters feel proud by reminding them of how she and her husband consistently keep their composure under stress; and then she inspired them with the challenge to “go high” rather than go negative. Sanders supporters in the convention hall laughed and applauded just as the Clinton supporters did at these words. Mrs. Obama reset the mood of the audience, putting them in a more receptive frame of mind to listen to her arguments on behalf of Hillary Clinton. The remainder of the speech was a logos-based argument in support of Clinton’s candidacy. In support of this argument, Mrs. Obama articulated Clinton’s extensive record of public service, her decades-long support of various Democratic causes, and evidence of her strength and tenacity. The first day of the convention included several powerhouse speeches by Democratic favorites such as Cory Booker, Elizabeth Warren, and Bernie Sanders. But Michelle Obama’s speech stood out for its exemplary use of pathos to calm and persuade an angry crowd. Verbal persuasion is an empowering skill. If you know how to speak persuasively, you can shine both professionally and personally. There is nothing quite like the feeling of speaking well and being heard. 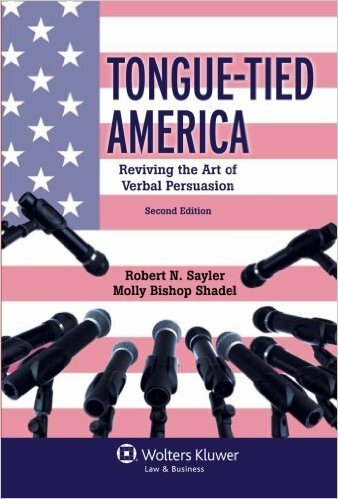 This blog, and our book, “Tongue-Tied America: Reviving the Art of Verbal Persuasion,” examine how rhetoric works. We are law school professors from the University of Virginia who teach advocacy, rhetoric, and negotiations. But our interest in oratory is not limited to the world of lawyers. We believe that anyone can — and should — learn to speak effectively. Verbal persuasion also plays an essential role in the proper functioning of a healthy democracy. Government “by the people” requires that the people be involved — that they possess some basic understanding of how to speak to one another, and how to evaluate what others are saying. Debate — even sometimes contentious, unpleasant debate — is the way we hash out ideas. The 2016 presidential campaign season is upon us, offering the perfect laboratory for examining the inner workings of verbal persuasion. The party conventions, political debates and various campaign speeches are exercises in rhetoric. The candidates and their supporters will try to persuade you of the wisdom of their positions; you may engage in a little political debate of your own with friends and family. If you understand rhetoric, you will be better positioned to evaluate the political campaigning that you hear, and to make successful arguments yourself. What can you learn about rhetoric from the 2016 presidential race? Has this race changed all the rules? Our answer: No. From time to time, we will offer rhetorical analysis on this blog. The point of this exercise is not to express opinions about the candidate’s political positions; instead, we will evaluate how the candidates express and explain their ideas.